XYNCoder is an all audio/video formats to MP4 batch encoding frontend. It can convert any audio or video file, that can be played back by MPlayer, to MP4. 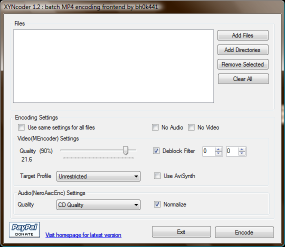 It uses the x264(mencoder) for video and aac(neroaacenc) for audio encoding. It can use AviSynth(optionally) to perform any preprocessing on the source. Also it can be used as a standalone encoding frontend for NeroAacEnc. Just add the files to be encoded, specify the encoding settings and hit 'Encode'. XYNCoder will run the required processes in background with low priority so you can perform other important tasks while encoding. Also, encoding can be paused/resumed as required. Added auto-updater. Detects when a new version is available on the web and allows to update. Now supports one pass mode only, replaced quantizer setting by quality slider. Please note that the author, bh0k441, of this freeware accepts no responsibility for damages, in any form, resulting from the use of this product. This software is provided "AS IS", and you, its user, assume all risks when using it.